When our families have a global perspective of the big, beautiful world out there, we're better equipped to fulfill our responsibility to love and pray for it. When my family began our journey in classical home education two years ago, there was perhaps no part of the curriculum that intimidated me more than geography. I could scarcely remember learning the world’s continents and oceans during my own academic years, yet here my five year old needed to memorize and trace obscure countries such as Kazakhstan, Uzbekistan, and Lesotho. I appreciate what we’re trying to accomplish here, I thought skeptically, but is it really necessary to know every nook and cranny of the world? At the time I thought I was being realistic; now I recognize I was just being lazy. In her book The Core classical educator Leigh Bortins explains, “Knowing geography gives structure to real stories … It’s easier to be charitable when you can empathize with another’s economic or ecological conditions. It’s easier to be politically astute when real wars are fought in places that are relevant to you.” And it’s easier to develop humility and compassion when we learn that there’s a big, beautiful world out there—a world we must know in order to fulfill our responsibility to love, steward, and cover it in prayer. Ephesians 6:18 says, “And pray in the Spirit on all occasions … always keep on praying for all the Lord’s people.” This month, take time as a family to dive into one (or all!) of the included activities for developing a global perspective and prayer focus within your home. With just a little discipline and creativity, a world-centered outlook is easily within reach. Pray together as a family about supporting a child in a foreign country. Ask God to lead you to the right child and to provide creative ideas for fitting the expense into the family budget. 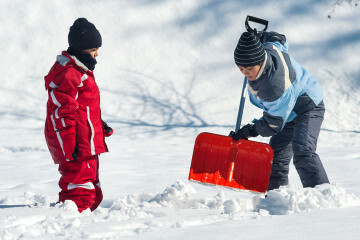 (Children can get involved by performing odd jobs for neighbors or collecting spare change throughout the month.) Organizations such as Compassion International and World Vision provide food, medical care, and the good news of the gospel to needy children around the world. Start a book club for your kids’ friends and neighbors and choose books that introduce new cultures. After you’ve studied together for a few months, host a Global Perspective Gala! Ask each guest to present a short report and share a dish from a different foreign country. (Costumes optional but highly recommended!) Jamie Martin’s book Give Your Child the World is an excellent resource for high-quality stories that help children fall in love with foreign cultures. Hang a large map of the world in a prominent place in your home. During your family’s quiet time, allow one member to make a paper airplane and “fly” it toward the map. Wherever the plane hits is your prayer target for the day! Operation World by Jason Mandryk provides detailed information and prayer challenges for every country of the world.